If black and minority ethnic (BME) talent was fully utilized in the UK, the British economy could be boosted by up to £24 billion ($29 billion). That’s according to a UK government report published last month. The report, commissioned by the former prime minister David Cameron, tackles the issue of why the British workplace doesn’t accurately reflect the diversity of the UK population. For instance, 14% of the UK’s working population are from a BME background, yet they make up only 10% of the workforce. The employment rate for ethnic minorities is only 62.8%, compared to 75.6% for white people. In addition, a higher proportion of people from BME backgrounds are more likely to work in lower paying occupations such as catering, hairdressing or textiles. BME employees represent only 6% of top management positions and there was virtually no ethnicity change in top management positions in the five years between 2007 and 2012. BME workers also have an underemployment rate – where people would like to work more hours than they currently do – of 15.3% compared with 11.5% for whites. All this means that the British economy is losing out on £24bn – 1.3% of its GDP. The report looked at reasons why BME workers aren’t getting ahead as much as their white counterparts. The top reasons cited included a lack of the “right” connections and discrimination. Other reasons included a lack of role models, a lack of jobs available in their area and qualification issues. “In the UK today, there is a structural, historical bias that favours certain individuals. This does not just stand in the way of ethnic minorities, but women, those with disabilities and others,” says the author of the report, Baroness McGregor-Smith CBE. In the US the picture is equally troubling. In a report by Pew Research , black people identified discrimination as a major reason why they have a harder time getting ahead. Blacks are more likely than whites to say black people are treated less fairly in the workplace, by a difference of 42%. 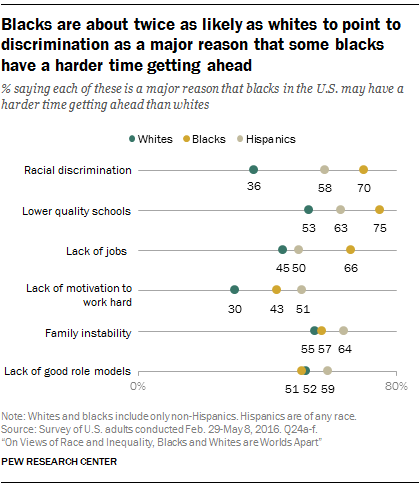 By a margin of at least 20%, blacks are also more likely than whites to say racial discrimination (70% vs. 36%), lower quality schools (75% vs. 53%) and lack of jobs (66% vs. 45%) are major reasons that blacks may have a harder time getting ahead than whites. The report also shows how lack of economic opportunity spills over into household income, regardless of education level. In 2014, income for households headed by blacks was $43,300, and for whites it was $71,300. Among adults with a bachelor’s degree, blacks earned significantly less in 2014 than whites ($82,300 for households headed by a college-educated black compared with $106,600 for comparable white households). A report written for The Conversation says that, like the UK, Australian workplaces do not yet reflect the level of cultural and ethnic diversity in the broader community. The Diversity Council of Australia looked at ASX 100, ASX 200 and ASX 500 listed companies, and found that only a quarter of directors are from culturally diverse backgrounds compared with a third of the wider Australian population, and only 5% are from Asian backgrounds compared with 8.5% of the population. Research conducted by Deakin University, which reviewed more than 300 studies , estimated that people’s exposure to racism accounted for a 3% loss in average annual gross domestic product in Australia – that’s A$37.9 billion ($28 billion) per annum. There was a direct association, the report said, between racism and a range of mental illnesses, including depression and anxiety. The impact of exposure to racism in the workplace was substantial, affecting a person’s health and career outcomes. Barones McGregor-Smith CBE, author of the UK report, made 26 recommendations for the UK government. They included making companies publish a breakdown of their workforce by race and pay band, making them have five-year aspirational targets and reporting against these annually, as well as making diversity a key performance indicator. There should also be mandatory unconscious bias training, she said. The Pew research found that more than four in ten blacks (48%) and whites (46%) say that working with community members to solve problems would be a very effective tactic for groups striving to help blacks achieve equality.